The Greater Cincinnati area and Northern Kentucky includes: Cincinnati OH, Bellevue KY, Newport KY, Covington KY, Erlanger KY and Florence KY. 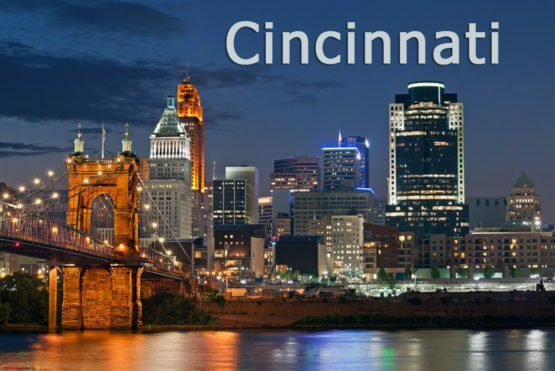 Located at the intersection of Kentucky and Ohio as well as the crossing of Midwest and North, Northern KY & Cincy are in the heart of the USA and far from ordinary! Whether it’s catching a major league baseball game and petting a live shark with the family, or reconnecting with a romantic weekend of art museums and theater, there’s always more to explore, new adventures to be had and memories to be made at Cincinnati and Northern Kentucky attractions. Newport on the Levee is an urban retail and entertainment center located in Newport, Kentucky just minutes from downtown Cincinnati. The Cincinnati Museum Center at Union Terminal is one of Cincinnati’s greatest architectural treasures, and offers three museums under one roof plus much more. The Newport Acquarium is a state-of-the art facility, on the banks of the Ohio River with some of the world’s most advanced, creative technology — not to mention amazing animals — all designed to take you around the globe, visiting each continent, every ocean and hundreds of waterways in between. The Cincinnati Art Museum offers free general admission daily at this historic museum that first opened in 1886. The Cincinnati Zoo & Botanical Garden opened in 1875, is the second-oldest zoo in the nation, and is a National Historic Landmark that is consistently ranked as one of the top zoos in the country. The Cincinnati Reds is Major League Baseball, historically as baseball’s first professional franchise, makes it home at Great American Ball Park in downtown Cincinnati. Northern Kentucky has generated lots of economic announcements in the past year–business expansions here, job expansions there–and the momentum continues into 2014. Much of the growth is thanks to a wealth of resources such as available land, a well-trained workforce and nearby transportation, including the Cincinnati/Northern Kentucky International Airport and DHL. Sixty-five percent of America lives within 600 miles of Northern Kentucky, so it’s a great place to have a redistribution center. Their growth is expected to grow due to nearby cargo capabilities, industrial infrastructure, collaboration among neighboring communities on both sides of the river, support from state and local governments and from local higher education institutions, and being along the I-75 corridor. Cincinnati has the fastest growing economy in the Midwestern United States. The Gross Metro Product is $119 Billion, and median household income is $56,538. The median home price is $152,500, and the cost of living in Cincinnati is 8.2% below national average. The unemployment rate is also below the national average at 4.3%. Procter & Gamble is one of many large corporations with headquarters in the city. Several Fortune 500 companies are headquartered in Cincinnati, such as Procter & Gamble, The Kroger Company, and Macy’s, Inc., among others. General Electric has headquartered both their GE Aviation business and their Global Operations center in Cincinnati. The Kroger Company employs 21,646 people locally, making it the largest employer in the city, and The University of Cincinnati second largest at 16,000. Ideal Corporate Housing offers corporate housing, in-between housing, insurance claim housing, military housing and student housing in the Northern Kentucky and Cincinnati region. We have flexible terms, affordable rates, abundant choice of locations in upscale, amenity-rich communities and we are locally owned and operated. We also have the largest inventory of corporate housing temporary apartments among our competitors. We provide our guests with quality furnished 1, 2 and 3 bedroom apartments, at prime locations, and in a timely manner. We research and find the best communities and develop a relationship with these selected communities to ensure our guests are treated with the utmost respect.